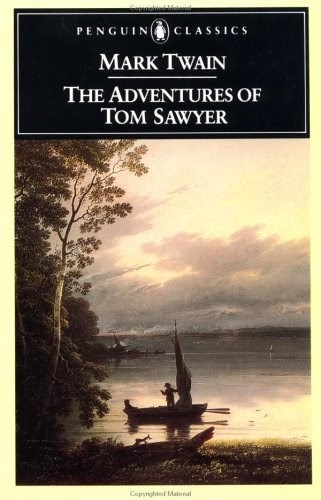 Impish, daring young Tom Sawyer is the bane of the old, the hero of the young. There were some in his dusty old Missippi town who believed he would be President, if he escaped a hanging. For wherever there is mischief or adventure, Tom is at the heart of it. During one hot summer, Tom witnesses a murder, runs away to be a pirate, attends his own funeral, rescues an innocent man from the gallows, searches for treasure in a haunted house, foils a devilish plot and discovers a box of gold. But can he escape his nemesis, the villainous Injun Joe? I never ever read this book as a child; this was my first time - berate me as you see fit. Despite this oversight, the book is still relevant to me as an adult in 2014, as it would've been had I grown up in the nineteenth century. The pains we go through growing up may have warped into something entirely different (think Becky liking all of Alfred's pictures on Instagram, rather than looking at a picture book with them for all the school to see) but the base emotions are still there, and in a way, still raw. Tom is a likable protagonist; he's an olden day cheeky chappie, a true comic, constantly getting into mischief and driving his family mental. Tom is quite transparent, however, coming across as mostly selfish, attention seeking, and covetous of leadership positions. I didn't grudge him this; I liked him a lot, and we did see his selfish acts mutate into acts of kindness and chivalry. Tom's flaws, however were a true contrast to my favourite character, Huckleberry Finn. Huck is a gorgeous character, living in severe poverty but appreciative of the freedom it gives him. He takes orders from Tom without questioning him because he's an outcast to the adults of the town, and glad of the company. Being a practical individual, with a heap of common sense, Huck complements Tom's dreamy fantasy worlds perfectly. He's a beautiful character, who I've truly fallen in love with. We didn't see as much of him as I'd have liked, and I'm really excited about reading Twain's novel about him. I absolutely loved the small, sleepy town of St Petersburg. It reads like such a relaxing lifestyle, and Twain's satire of their customs and beliefs is as funny as it is enlightening. Add his colloquialisms into a mix, and you're in the blame South. At this time, slave ownership was common, and legal, but the novel doesn't deal with many racial issues, instead only mentioning them subtly. Injun Joe's place in the town was lower than others' due to his mixed race, and the 'n' word does crop up, but Twain doesn't allude to race any more than this. An absolutely gorgeous picture of childhood in the 1870s, and based on Twain's own, The Adventures of Tom Sawyer is a true American classic - one I wish I had read sooner.